2017 has just begun and there are a lot of people who are using different social media networks for personal uses but want to know which is the best if they want to use them for a business purpose. In 2016 we saw a lot of interesting statistics about new milestones that the most known social media networks reached. For example: at the beginning of June 2016, Snapchat had 150 million people using their social app each day compare to Twitter, that has less than 140 million users on a daily basis. Meanwhile, Facebook has 1.18 billion daily active users on average (September 2016) and 1.79 billion monthly active users (September 30, 2016). Less than a month ago (December 15, 2016) Instagram announced they passed 600 million accounts, the last 100 million accounts have been added in the last 6 months. In this conditions, a lot of people (social media managers, marketers, managers, CEOs, advertisers etc) are asking themselves: which will be the top 3 social media networks in 2017? At this important question, there were 27 social media experts that were very kind and send me their answers… which you can read them below. 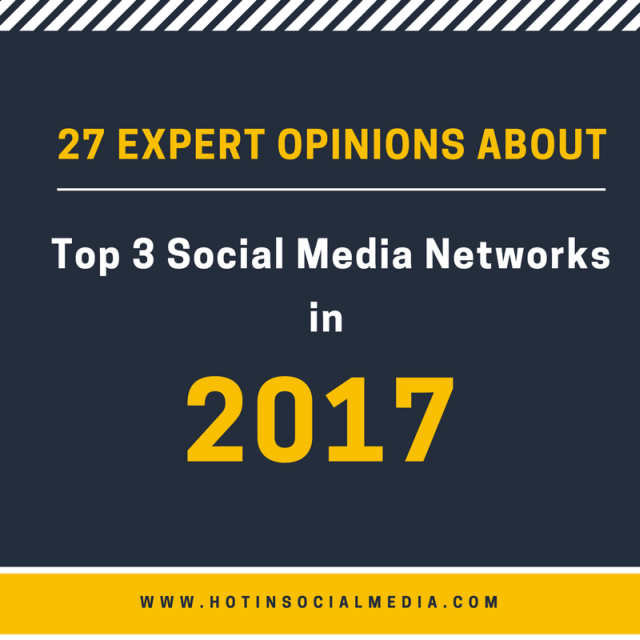 Thanks a lot, guys, for sending me this relevant opinions and explanations about your top 3 social media networks in 2017! Which will be the Top 3 Social Media Networks in 2017 and why? 1. Facebook – Because Facebook has made the art of social content an addiction for the masses. It’s where people are spending their time and as the old saying goes, you have to fish where the fish are. 2. LinkedIn – The opportunities for business marketers to connect with specificity to their buyers on LinkedIn is virtually unmatched. 3. SnapChat / Instagram – This is a tie because both are innovating and have momentum for adoption and engagement. Feature competition is only going to make these two networks stronger in 2017. Facebook, Twitter and Instagram. Sorry to leave out Snapchat- but until they make advertising available to everyone, I can’t include it, because I’ll never recommend a platform where organic is the only option. Used by 70% of the global Internet audience, and 70% of Americans over 13. Has 3x the users of Twitter or LinkedIn. The best one-stop way to reach most customers of most businesses. Americans spend 50 minutes a day on it. Best ad targeting there is second to Google. Works not just for B2C but also B2B with job title targeting, seniority, company names and company size. Has two apps in the top 5 (if you include Instagram). Can be used to advertise on Instagram. Over 50% of marketers would choose FB if they could only market on one social network. Unique in its incredible control over cost if you increase CTR- and because of this, the most affordable ad network there is. Still, a staple when it comes to influencers, blog promotion, trending topics and tweet chatting. Easy to data mine and search. Twitter Ad network is not as horrible as some. Still, there are questions about whether Twitter will remain relevant. Need to keep an eye on it. Along with FB and Snapchat, one of the three most popular social networks with youth. Great organic engagement (much better than Facebook). Can be advertised on via Facebook ad system. However, everyone is still figuring out the most effective ways to advertise and get bottom line results with Instagram ads. Facebook is still the easiest way to get leads, sales and app installs. 1. Facebook… the hub of everyone’s life and social presence now and for the foreseeable future. 2. Instagram… the easiest to use and the utter simplicity of creating content at scale. 3. Twitter… real time news, easy conversation, and the customer service social go-to platform. The top 3 social media platforms will be Facebook, Instagram, and Snapchat. Facebook will continue to be the most important because of its massive reach and constant growth globally. But with live video and additional features being added to Messenger and other tools, Facebook will continue to find ways to keep people more entwined on the platform. Instagram will continue to grow in popularity and demographic reach in 2017, finding more commonplace use across more age groups. And with more emphasis on Instagram Stories, they are expanding that reach and use even more. Snapchat won’t die out, even with Instagram’s efforts to replace it. I actually believe the back and forth battles between Instagram Stories and Snapchat will fuel both platforms forward in 2017. Useful is a relative term. I think each social media network can serve different purposes. You need to know where your customers go to get information and how to use each social media network. It’s not about which social network is the most useful. It’s about which social media network you customers find useful. With that being said, the usual suspects are Facebook, LinkedIn and Twitter. For China, the popular platforms are WeChat, Weibo and RenRen. For Russia, they likely are Vk.com, OK.ru and Facebook. See how the popular social media platforms can be different from country to country. The top 3 most useful social media networks in 2017 depend entirely on you, your business, and your audience. What works for a large nonprofit may not work for a small local business. However, I will tell you the 3 social media networks that I will focus on in 2017: Instagram, YouTube, and LinkedIn. 1. Instagram is growing at a phenomenal rate. It also has the highest engagement per user of all the social networks (except maybe for Snapchat, but it’s hard to find hard data about that platform). Instagram is a perfect channel to showcase who you are, your products, your services, and give a glimpse into your personality. 2. YouTube is the second biggest search channel in the world. The video is and will undoubtedly remain the most popular form of social media content, across demographics. Your mom loves YouTube, just as your teenage niece loves it. People go to YouTube to watch videos, and they tend to watch more than one per viewing. Take advantage of this and make great videos specifically targeted to your audience and customers. 3. LinkedIn is underutilized in my opinion. Blogging on the platform will undoubtedly grow, and that is where LinkedIn’s power lies. I receive more views on my LinkedIn status updates than I do on Facebook, and I receive very high-quality leads on the platform as well. Randy Milanovic is an entrepreneur, marketer, author and blogger of online marketing & SEO. A 4x author, he’s also a stage IV Cancer Survivor who has been seen in: forbes.com, business2community.com, steamfeed.com, socialmediatoday.com, financialpost.com, spinsucks.com, the CTV News, and recently, the was featured nationally in the Financial Post Magazine: Entrepreneur/Innovator edition, article titled: Keep Running. 1. Instagram: every time Facebook sees a popular feature in a competing app, they add the feature to Instagram. I suspect there’ll be a legal battle at some point if they keep copying competitors, and it’ll take a competitor with deep pockets/resolve to do it. With Snapchat launching Spectacles, it’s clear they see the writing on the wall. But Spectacles?? We’ll have to see how wise they are with that one. 2. Facebook: I suspect it is simply too big to fail. While funny memes will always provide entertainment for users and fake news (propaganda?) will continue to help elect politicians, a reality is that marketers will be happy to spend to reach the demographics/psychographics of a billion users Facebook so expertly identifies. General discussion amongst marketers around the water cooler is that the ROI of high performing ads tends to diminish the longer they run or the more budget is put on them, causing marketers to rework ads to maintain ROI. Here’s the one that has my attention the most. Microsoft’s user base plus LinkedIn’s user base is a decidedly 1+1=3 scenario. Question is, just how are users going to be leveraged to recoup the $26 billion dollars spent? No sane person things Microsoft is going to give it away. We’re already seeing a reduction in access/gating and adjustments to features in some membership levels. And more ads. Some days it feels like every second post is sponsored. Facebook, Snapchat and LinkedIn. Facebook will hit 2 billion users in 2017 so hard to ignore. Snapchat will continue to grow rapidly. LinkedIn is an amazing tool for B2B that is vastly underutilized. For B2B LinkedIn, Twitter and Instagram will remain the top three networks. Unless LinkedIn and Twitter up their game, they will lose out to the might of Facebook. We will also see more use of private social networks, but still with the social naturals. The top three most useful networks will vary greatly from business to business depending on their audience and best use cases. However, 2017 will be the year that Facebook rises to the top as the most useful network for virtually everyone. While it’s been the most popular network for some time now, there’s always been debate among businesses and marketers as to the value of Facebook on a case by case basis. Some businesses might have a lot of luck using Pinterest, while others might prefer Instagram or LinkedIn. But soon, there’ll be no doubt that Facebook is the clear winner. Between Live Video and Events and Targeted Ads, there’s just no equal. Top 3 social media networks often depend on what the brands are looking for when it comes to defining success and measurement. For most brands Facebook/Instagram will be the place for nurturing their existing audience and leveraging creative content, Twitter will still be leveraged to reach a new audience and expanding their community and Snapchat will be the place where brands aren’t as worried about reaching their consumer on the platform rather those who influence the consumer’s purchasing decision. Keri Jaehnig is the Founder and CMO of Idea Girl Media, an international Social Media Marketing Agency that works with business brands, public figures & select non-profits, providing customized marketing campaigns and social media training. Now the Social Business Faculty Chair at Simplilearn, I am humbled to have received a 2013 Small Business Influencer Honorable Mention Award, and a commendation for Outstanding Attainment in Social Media from the Senate of the State of Ohio. My insight has also been featured at Social Media Today, SteamFeed, Search Engine People, and AOL Small Business, as well as Forbes and Business Insider. Non-fat lattes, travel & quick wit make me smile, and I am always enthused to meet new people! This depends on your professional field or purpose of use. Every niche and every business will be different, and every person is different. So, we must consider what combination will bring the most customized, appropriate result. That said, our society is increasingly more visual in nature. So, social networks that offer a visual element will continue to be useful. There are many recent advancements with video – Especially live video. This feature allows brands and public figures to build important relationships with their fans and followers. Facebook, Instagram, and YouTube speak to this. Pinterest has also been making strides with their platform which will be optimal for those in travel, real estate, home decor, culinary, and the like. Still, relating that back to your own blog and website is the key to online marketing success. Instagram just keeps killing it with new features. It’ll be number one for next year. I really hope Twitter is still around next year. It’s my favorite and it continues to be the number one driver of social media referral traffic to our blog. I know email isn’t social media, but it’s far more effective for nurturing prospects and converting sales than anything else. I believe the top 3 most useful social media networks in 2017 will be Facebook as it never stops innovating and provides the main hub for social media users and now Facebook at Work for business communication. Instagram has also released a few updates in 2016 like stories and longer video uploads which will continue to increase its popularity and use. Finally, with LinkedIn recently being acquired by Microsoft in 2016, I’d have to recommend keeping active and on top of that platform, especially for display advertising. I think the top three, in no particular order, will be Pinterest, Instagram, and Facebook. They all are heavy in the visual field, which I mentioned I see as one of the biggest social media trends for 2017. They all offer, or will soon offer, the ability to buy a product directly from a post, which is vastly important to retail businesses. And they all offer analytics for social media managers to use to see what’s working, what’s not working, and provide ROI data to the C-suite. Facebook continues to be big because it’s the top-performing platform in the social industry. Instagram continues to grow and evolve, and brands should use it if it makes sense for their business. LinkedIn continues to dominate the B2B landscape and should be used by businesses, even if it’s just encouraging their employees to network professionally. Instagram and Snapchat continue to be popular among younger demographics who have quick attention spans and a hunger for brand interaction. YouTube is essentially the millennial go to hub for news, lifestyle and entertainment content. The common thread in all effective marketing channels is short visual bites that can be consumed quickly on mobile or large screens. Probably the 3 biggest networks right now by monthly visitors: Facebook, YouTube and Twitter. If anything, LinkedIn at #4 may close the gap on Twitter and even overtake (currently around ~50M difference in users) if they have a big year. Facebook due to its sheer size and constantly improving the algorithm, Snapchat as they have the pulse of today’s youth and Instagram for a combination of the two reasons above. They are mimicking Snapchat in terms of platform capabilities but have the power of FB behind them and are working hard to get a handle on m-commerce as well as consumer engagement. This is impossible to say – each brand will have a different top three, depending on their audience, their products or services and what they’re looking to achieve. The best advice on this is to analyze your audience – use a tool like BuzzSumo, for example, to see which networks are seeing the most share activity on content related to your business niche. Look at key influencers in your market and where they’re active (and what response they’re seeing), look at other brands and benchmark their performance on each platform to see which are generating better results. There’s no “one size fits all” approach to social media marketing, it all comes down your audience and their behaviors. Go where they go, provide them with information relevant to their experience and you’ll be on track to maximizing your success. Facebook, Instagram, and Snapchat. Facebook is pretty solid at the top and probably will be so in the coming decade or so. But Instagram and Snapchat are the true game changer (in the past), and it will continue to play a dominant role especially in reaching the millennial market. However, trends are showing that growth beyond the millennial age-gap is slowly growing especially in these platforms. Facebook, Twitter, Instagram, and SnapChat (I mean Snap) are becoming everyday staples in our day-to-day, but what I find most impressive about these social networks is their ability to continually evolve over time. 2016 was about the video and all these social networks got onboard (for good reason). We love watching videos. Who hasn’t fallen victim to watching a 30-second video on YouTube… four hours later… still watching videos. Instead of asking which social networks are at the top of your list for 2017, I would ask marketers what their video strategy is for social is in 2017. How do you intend to utilize video on Facebook, Twitter, Instagram, etc. for the new year? I think Twitter is going to soar in 2017 due to the giant spotlight that was put on it during the elections this year. Brands will definitely be finding a way to ride the coattails of its rebirth. After Twitter, I think Facebook will continue to be a valuable player. LinkedIn will become a much more valued network as employee advocacy begins to rise within brands as it’s one of the main network’s employees share to from advocacy programs. Facebook, Instagram, Snapchat. Unfortunately, Twitter and Google+ are losing their authority. Facebook, Instagram, and Twitter – All for the same reasons which are live-streaming, video and for their great engagement rates and reach. The top social media networks for 2017 will vary for people based on their messages and audience. In general, Facebook will be at the top, and for my business, Pinterest plays a large role. YouTube also has great value to growing a business. Facebook’s selective targeting feature allows businesses to connect and engage with the audience that will most appreciate their content and resources. Pinterest is specially designed to showcase images, which helps businesses show off exclusive designs and infographics. YouTube allows customers to see a different side of business owners when they put themselves out there in a way that’s both entertaining and honest. This allows customers to see the human side of your business and creates a sense of a connection.